The Emily Carr OneCard is your Emily Carr University ID card that will provide access to library resources, A/V equipment checkout, and campus facilities as determined by your program or user level, including classrooms, shops, studios, and any other areas and resources that are assigned for your specific requirements. Your first OneCard is free of charge. Any replacements are $10.00 per card. Minimum width and height of 425 x 425 pixels. OneCards will be distributed at orientation. Your new OneCard should work immediately for common areas and your registered classes. 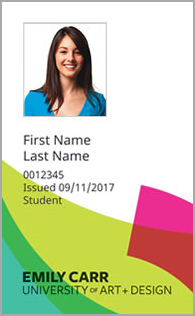 Your OneCard includes your photograph and student identity number and should be protected from loss or use by others. Report a lost or stolen OneCard to Security immediately. Visit Student Services in the Student Commons to request a replacement card and pay the $10.00 fee. Your replacement OneCard will not work immediately: it takes approximately 2-3 days for it to be activated. If your OneCard access does not work within 3 days, contact ithelp@ecuad.ca.